Hey everyone! Happy Monday and HAPPY NEW MONTH! Today I bring you a post on how to WHITE WASH a boring clay terra cotta pot to give it some nice french country style. I always love the start of a new month, especially May because we take so many fun trips and we celebrate both Nick and Savanna's Birthdays! We usually spend our first weekend of May every year at the beach, it's pretty much the kickstart of our Summer, and I just get all the feel good vibes! Plus, I'm usually spending a lot more time outside, playing with dirt and getting my hands dirty, is it weird I love the smell of dirt btw? MEH. 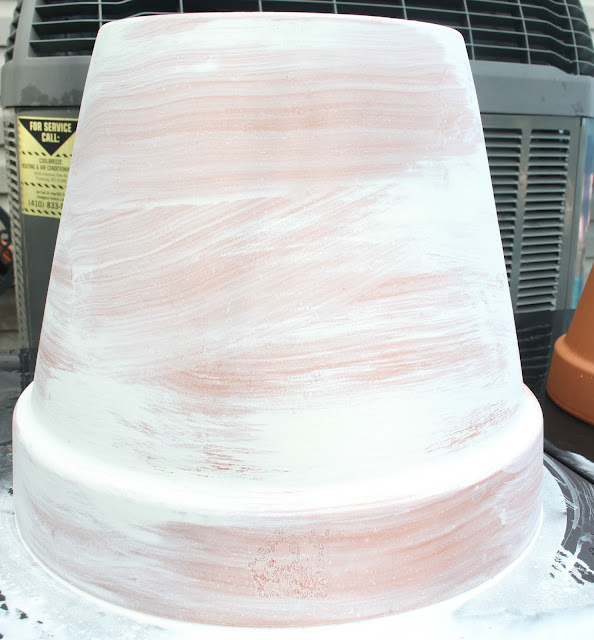 So yesterday on my Insta Stories I shared a little step by step tutorial on How To Whitewash a Terra Cotta pot. Ya'll it's SUPER easy, and painting is therapeutic for me so any chance I get to paint, I do. Creating things is good for your soul, no matter how big or small it is. But I'm happy to say that on a DIY scale of 1-10, 1 being super easy and 10 being hard, these pots are like, a 2. 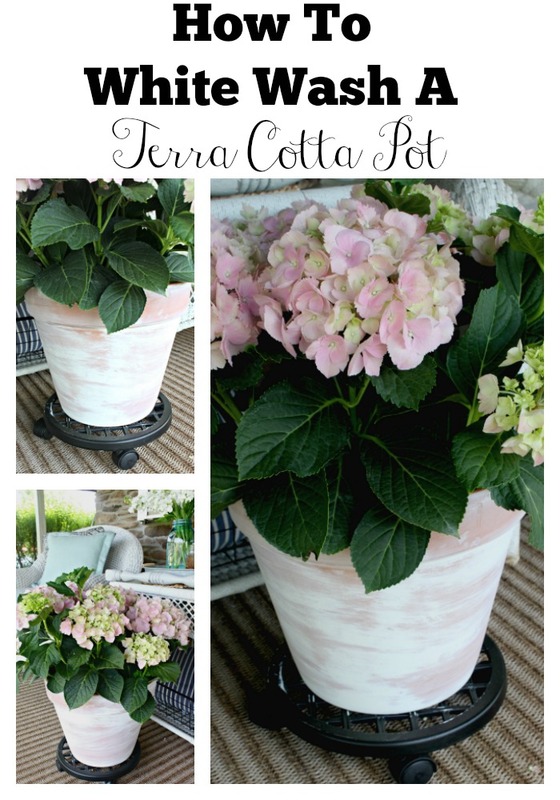 And even better is that you can get terra cotta pots for literally next to nothing at places like Home Depot or Lowes. If you're like me and pretty much hate putting on pants and like to Amazon Prime your life, you can get some Terra Cotta Pots online here. 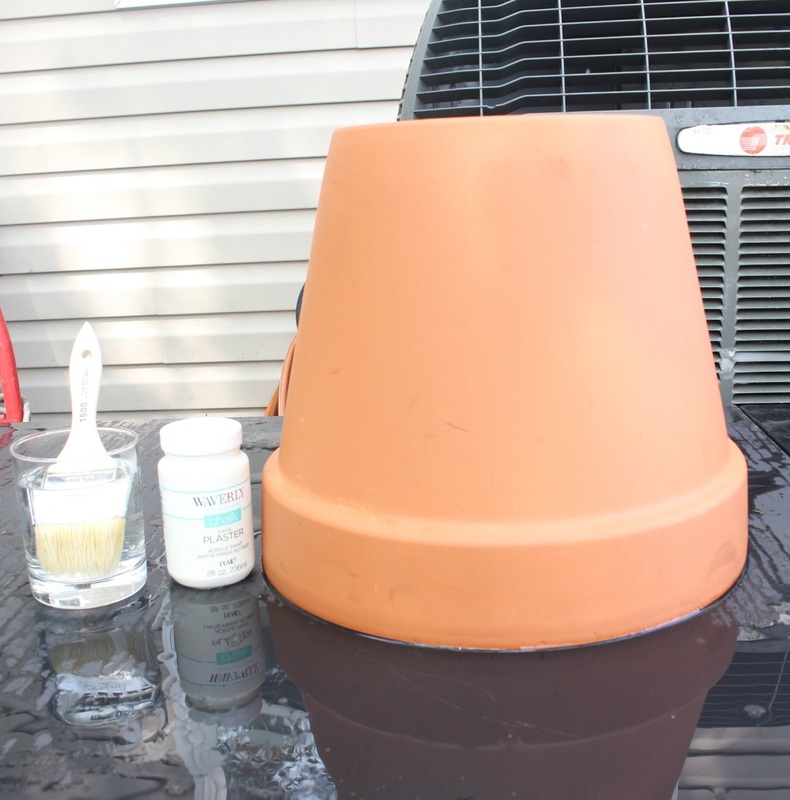 I started by using the hose to wet the planters and clean them from dirt and grime. Be generous with the water, the clay pots soak it right up. Then I used a plastic lid as a paint palette, because I'm thrifty like that..and who actually has paint palettes? Hmmm? Tell me!! 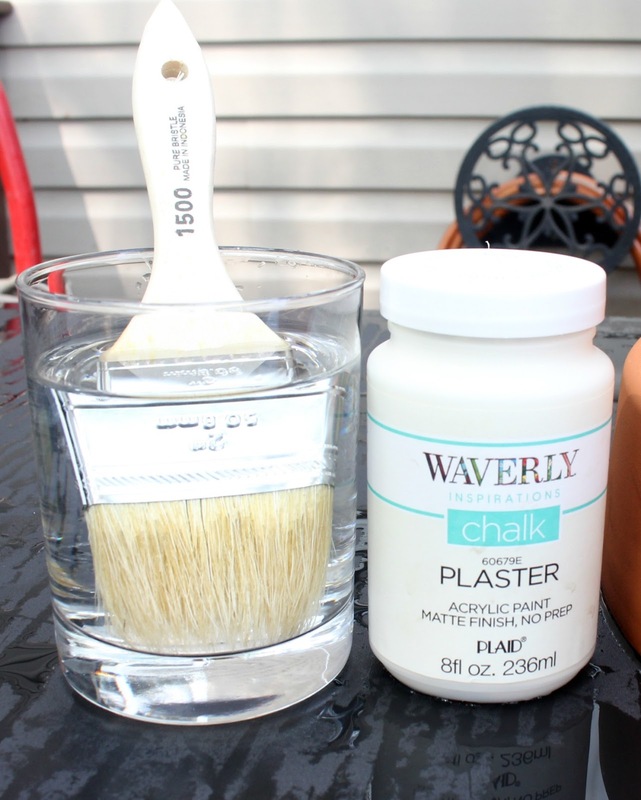 You guys know I love my Annie Sloan chalk paint for big paint projects, but for smaller projects I really love the little plastic containers of paint. Like this one here. It's inexpensive and get's the job done on smaller projects, I also buy the cheapest paint brushes money buy, I stock up on these for my little projects because let's be honest, I'm lazy and I like that I can just throw away the paint brush when I'm done. I have a teenager and a toddler, I NEED EASY AROUND HERE. Plus you can use them for everything, all sorts of paint, paint stains and other varnishes, and Savanna likes to use them to paint. So they're worth every single penny. I got my cup of water, and was ready to get to work! YAY! The key to whitewashing is to make sure your brush stays fairly wet, the more water, the lighter stain you're going to get, however you have to move quickly to avoid runs, the clay pots dry SUPER fast, so you really do have to move quickly. 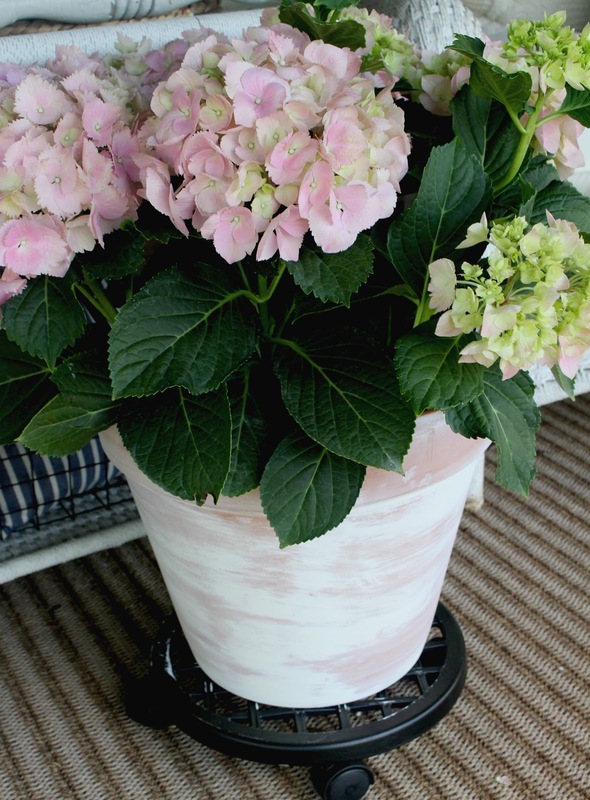 I start by randomly painting spots of the planter, it will give it a nice light distressed look when it's all completed. While the paint is still wet, I take a wet paper towel (or cheesecloth, whatever you have!) and give it a light wipe down, this gives you the nice light wash you want when you think of whitewashing. 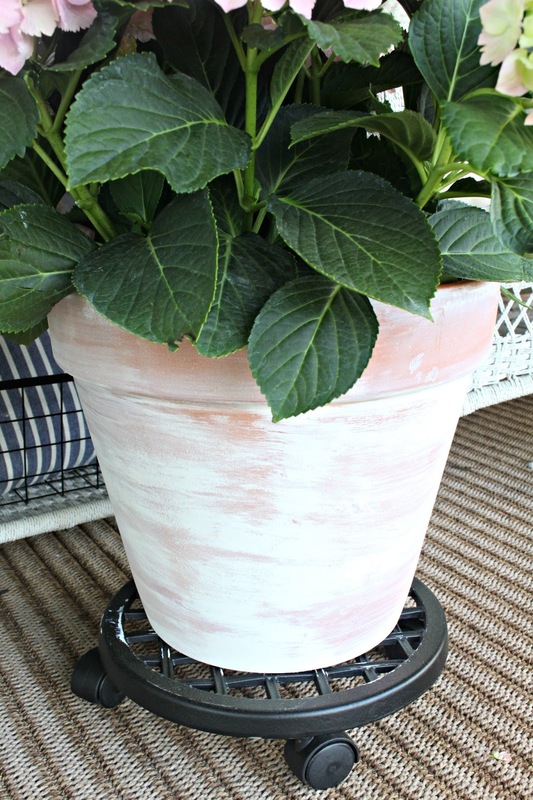 Your planters will dry quickly so I almost immediately start sanding! I just used this sandpaper here because it's what I had on hand. I wasn't about to take a trip to the store, I was determined to get these done. AND NOTHING WAS STOPPING ME!! *Cue Super Hero Music* I just randomly sanded different areas, like I often do when distressing, not really using any sort of rhyme or reason. I always love distressing things for some reason. It's like the icing on the cake and always completes the look. Plus, it's fun. And that is IT my friends! Yes, I know, SO EASY! 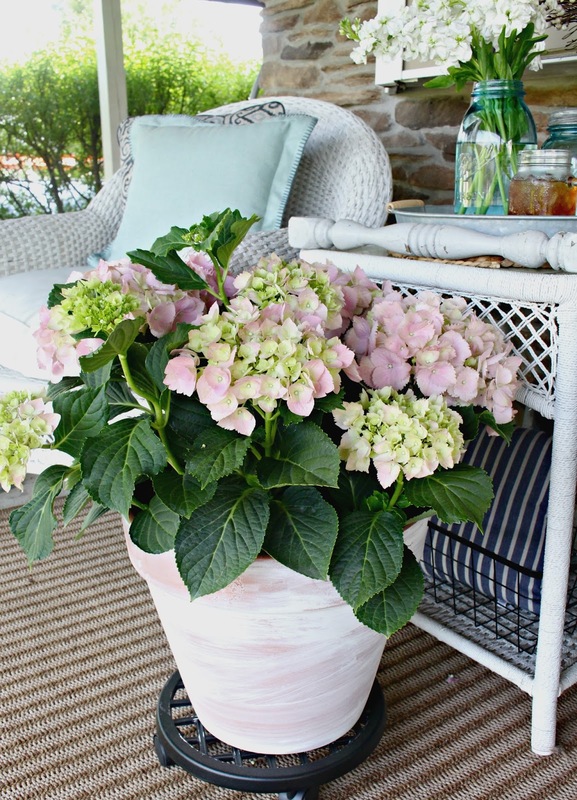 And takes those boring old terra cotta pots from drab to fab, I mean, how french country farmhouse are hydrangea blooms in planters? PS. I'll be doing a post soon on my tips for growing hydrangeas in planters! 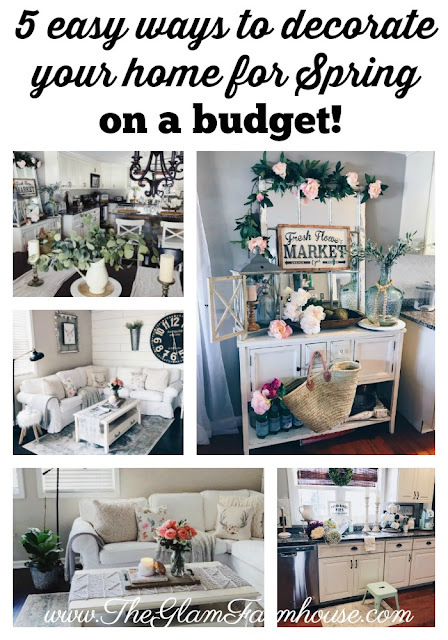 Don't forget to give this post a pin if you enjoyed the post of found it helpful! You guys are THE BEST! This post contains affiliate links, but all opinions and product recommendations are my own! 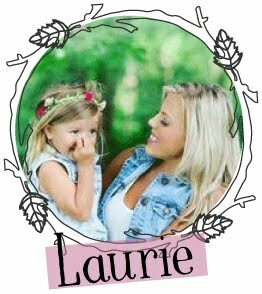 Thank you for helping make this little blog possible! This turned out so great! I'm such a fan of painting everything white!! I love gardening and thanks for the information on Terra Cotta Pot.I want to paint my pot.After found your blog I planned to paint my Tera coat pot also.At my home there are so many pots are available and I want to make them different recreation.When I working at best essay writing service I got certain plants.Thank you so much for the post.